Stay with us as we guide you through where to buy Siku toys for sale in here in the UK, from major retailers to niche online sellers. 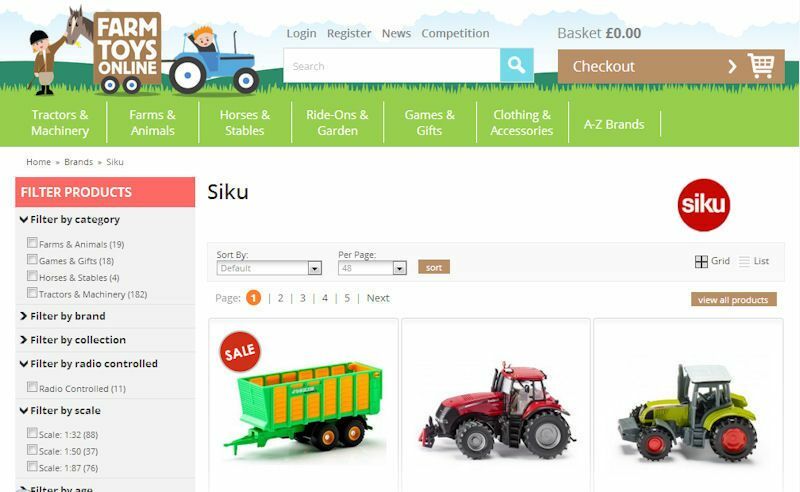 The number one place to buy Siku toys are online, here you'll find not only the Siku Farmer range, but the complete collection available from Siku. Whereas in-store, on the high street it's harder to find Siku toys, but your local model shop is worth visiting. So to get the ball rolling, we'll try and send you on your way to buy Siku toys available across all channels, both online and in store. We should tell you it's highly difficult to find the Siku range from popular and less known toy shops on the high street. This is largely to do with retailers playing it safe, so they will sell mostly popular, trending toys from Disney and Lego, or very cheap brands to fill up there shelves. And well very few toy shops on the high street do sell Siku, these are limited to local businesses in cities and small towns. You're unlikely to find Siku toys from places such as Argos and The Entertainer. When we say models shops, we are not talking about toy shops, but those hobby shops that sell plastic model kits with paints. The shop is usually riddled with glues and accessories for building model train layouts with scenery like miniature trees, grass and buildings. What these models shops do stock - like our local Hereford Model Centre - is supply a unique range of toys that high street retailers rarely sell themselves. Therefore local model shops focus on brands like Siku, Bruder, Britains and more to provide a niche range - though only a small selection mind you. If there are two places that are almost guaranteed, not to just sell a small Siku range, but the current collection with toys from both the past to present - are Amazon and eBay. 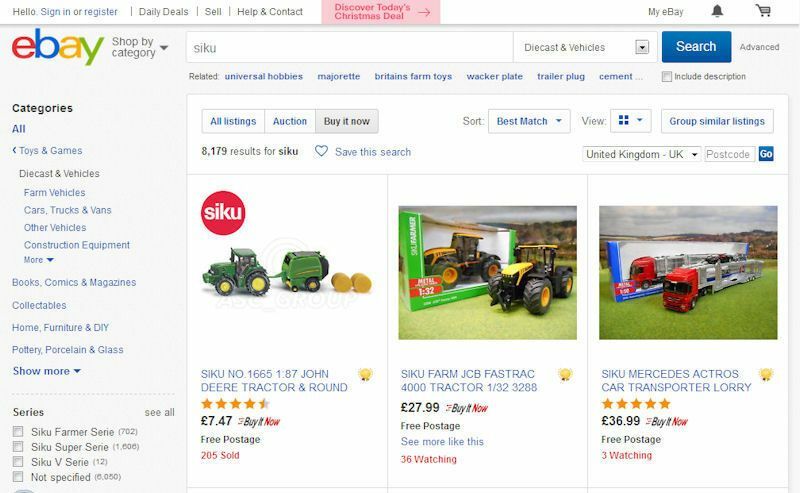 Simply search "siku farm toys" as you do with Amazon and you'll be greeted with the whole Siku range presented on dozens of pages within their catalogue. 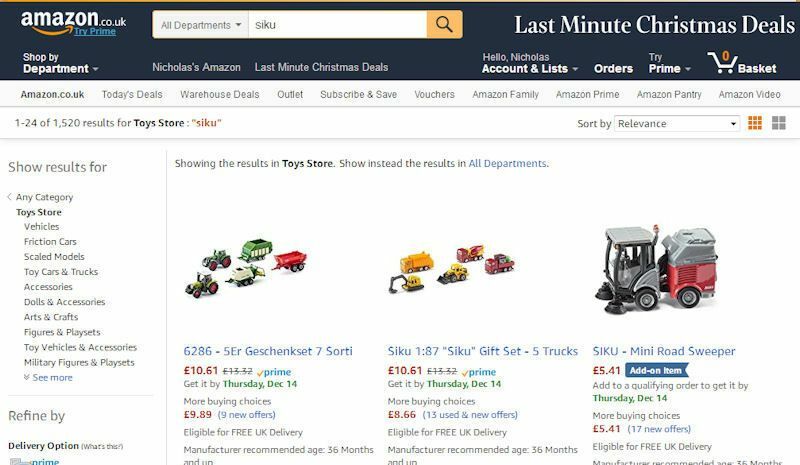 In Amazon you have Siku toys ranging from their Farmer to construction toy collection, with absolutely everything else included. Amazon should be your number one place to visit online as they will almost be the cheapest with a large sort of competitors competing for the ‘buy it' button. You can garentee Siku will always crop up for auction or buy now on eBay, search for Siku toys to bring up the latest items for sale. Likewise, well you can ‘buy it now' with eBay like Amazon, you can also go through the process of an auctioning with eBay, so once in a while you just might get an absolute bargain, but just keep an on the delivery cost. For both Amazon and eBay, simply use their search function to search for ‘Siku toys' and be rendered the full selection. Big supermarkets are the biggest culprits for not supporting small, less known brands like Siku. But for good reason as the toys are expensive to buy, and for the big supermarkets like Tesco, Asda, Morrisons and Sainsbury's - it's a big risk. Tesco shoould be your last choice as the selection is often limited and expensive, but again you'll beed to search the Tesco online catalogue to view any Siku toys. 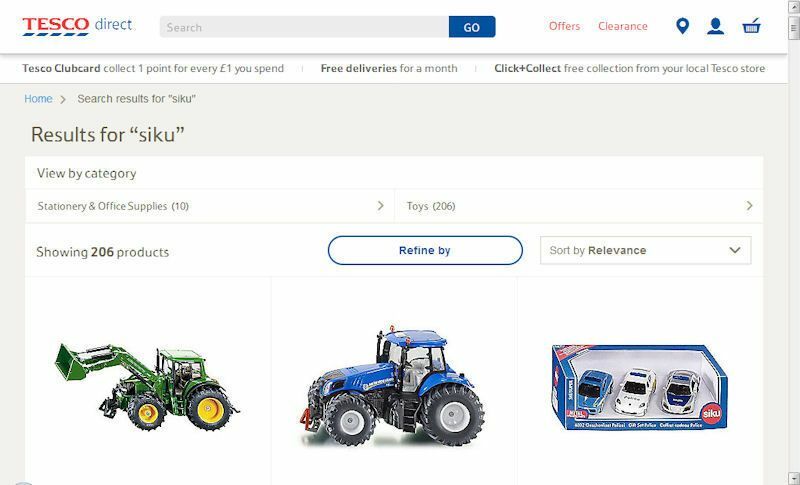 However, for Tesco Direct acting like a marketplace for all, you could do a search their with your search results coming back with a select few of Siku toys - use the following link to view what Siku toys currently available from Tesco Direct. Niche online farm toy shops sell only farm toys, so be sure to visit one for the best experience when it comes to buying farm toys. When you do a Google search for Siku toys, you'll be met with a long list of shops that sell Siku, and to be fair that's all you need. Farm Toys Online - Delightful, friendly farm toy niche web site selling not only Siku, but farm toys from all brands, with a few extras. Elite Toys & Models - Well established online toy and model shop selling a full range of Siku toys and so much more. Well we won't recommend buying from Siku Germany - due to delivery costs - their website is useful for getting hold of product details; measurements, scale, range, etc. 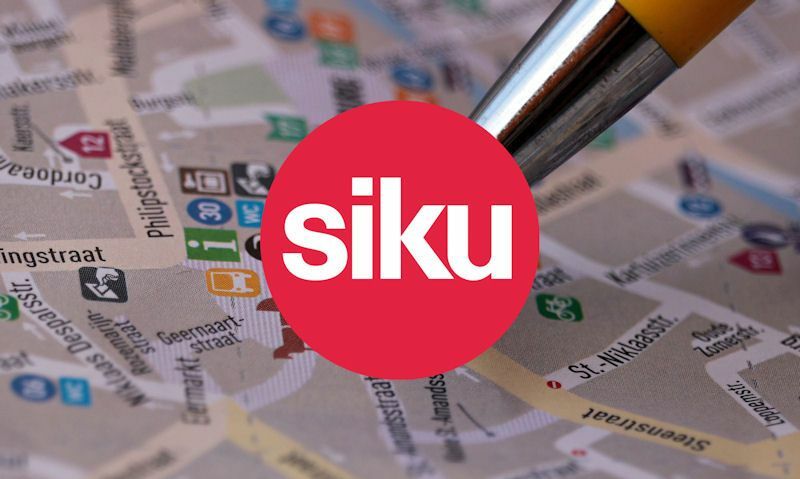 Well we should recommend you buy through Siku's official website as your first destination, you should know Siku are based in Germany, and therefore additional costs will apply, with products costing more directly through Siku than their resellers. 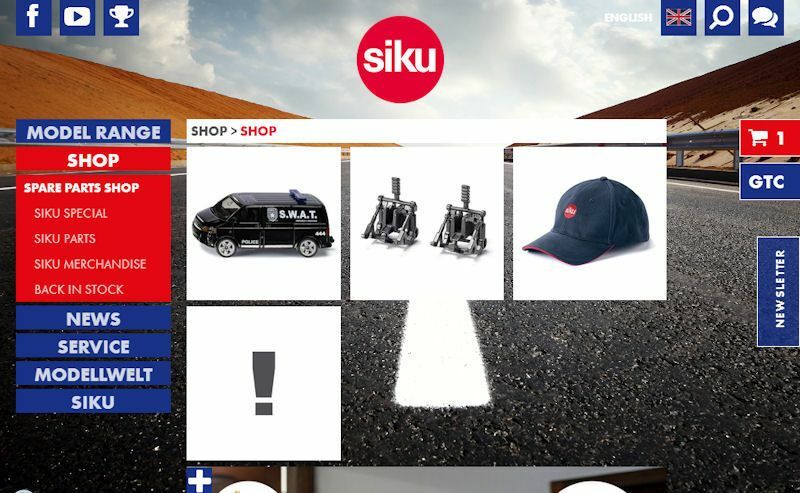 Better still, you can visit Siku's official main dealers website in the UK for everything Siku, well all products are stocked and ready for dispatched from within the UK, but don't get caught out, shop around for special offers and lower prices.